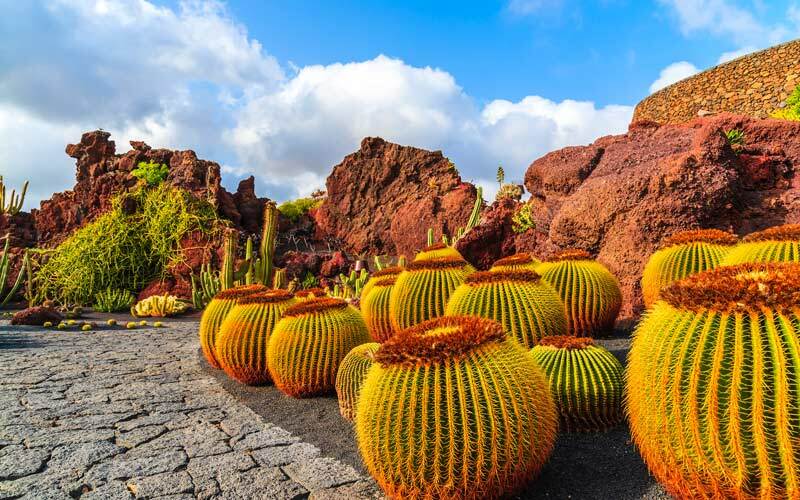 Among the rivers of volcanic lava that formed the mysterious landscapes of Lanzarote, we find the unique Cactus Garden of Guatiza, one of the last landscape masterpieces created by César Manrique (1919-1992) on his native island. He conceived all of them to highlight the charms of its unusual nature. “Lanzarote is pure magic… clean, unusual, naked beauty, a constant lesson. Its unknown and profound nature is aware of the great spectacle it offers,” commented this versatile artist. After two decades of intense artistic activity in Madrid and three years in new York, Manrique, linked to the pictorial movement of Informalism, returned definitively to Lanzarote in 1966. After that, he did not stop in his attempt to safeguard its natural and cultural landscapes. It would be impossible to imagine the island as it is today without César Manrique, pioneer of sustainable tourism development. The Cactus Garden of Guatiza, created in 1990, combines – as is usual in the spatial interventions of its creator – art, architecture and landscaping, while merging traditional and local elements with a contemporary artistic language. Manrique called these creations, closely linked to the landscape of Lanzarote, “art-nature/nature-art“, conceived to reflect about the relationship between human beings and nature. The choice of the location of the garden is very thought out, since it is located in the heart of the area where you can find the most chumberas (a prickly pear cactus) of the island. They were once an important source of wealth because these plants parasitize the cochineal from which the carmine is extracted, a natural, invaluable coloring. 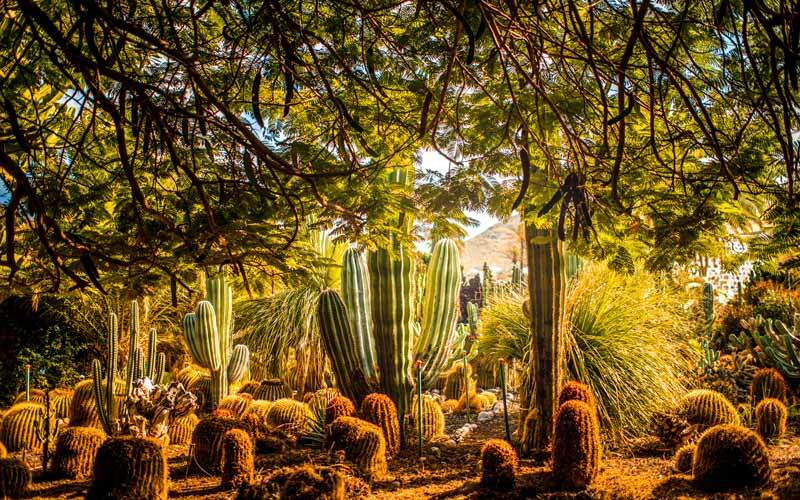 Manrique created the garden in the midst of this sea of cacti, inside an abandoned quarry, with the hope of rehabilitating a degraded space. Previously volcanic sand (called picón) was extracted from this area, which is used in the cultivations of the island and in the Cactus garden to maintain the moisture in the ground. Thanks to its semicircle structure, the space is an authentic vegetable amphitheater populated by about 10,000 succulent plants with a variety of almost one-thousand different species. Most of them belong to the cacti family and are native to the American continent, while the native flora of the Canary Islands is represented by Euforbias and other ‘crásulas,’ such as Aeonium lancerottense, endemic of Lanzarote. These curious plants that look like sculptures – experts in storing water – are found here in perfect harmony with the desert environment, stony soil and heavy rains. Many have spectacular but very ephemeral blooms, such as the Selenicereus inermes, which only lasts a few hours during the night (so it is nicknamed the “Heartthrob of the Night”). The garden terraces remind us of the traditional banks of the island’s crops. From them, we can admire the spectacular scenery starring large monoliths of petrified lava. They are remnants from the quarry that the artist recovered and preserved, turning them into sculptures.